If you are working with a tight budget yet want to have a big impact, you have come to the right place. As the top supplier of custom banners for North Jersey, The Sign Center has found that banners are a cost effective solution for your business to build awareness about special events and promotions. Through our many years producing signage for clients in the region, we are sure banners will also serve your business well. There are two main styles of banners. 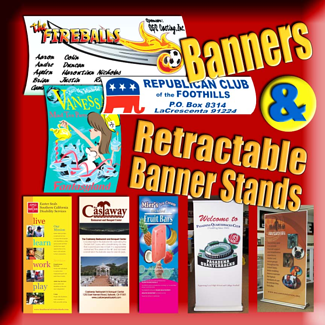 Your message can be digitally printed directly to the banner material. Or, you can apply cut vinyl letters and graphics to it. There are benefits to each method. Even if you do not have much money to spend, you can get plenty of bang for your buck with large, vibrant digital banners. The addition of full-color logos, background textures, and digital photos to your banner is sure to turn heads. These markers are also ideal if you want a lightweight, short-term, portable sign for an event or long-term signage for a warehouse wall. Crisp, clear cut vinyl banners are an inexpensive option for getting your message in front of as many people as possible. These attention grabbers are the smart temporary signage choice whether you display them in a busy enclosed retail area or in a high traffic outdoor location. We supply dozens of standard banner colors as well as a broad range of standard vinyl graphic and letter colors. Cut vinyl banners can stand up to the harsh North Jersey weather. As with the digital banners, these markers come finished with grommets and hems, so you can install them yourself, or we can do it for you. If only the date and time change on an annual event you host, your best solution is cut vinyl banners. When you bring in an old cut vinyl banner promoting your golf tournament, charity event, festival, or other get-together, we will gladly update the date and time for you. Compared to buying a whole new banner every year, this is much less expensive. Additionally, cut vinyl banners roll up for easy storage and transportation. The Sign Center takes care of all of the signage needs for businesses throughout North Jersey. From our headquarters in Berkeley Heights, New Jersey, we are proud to supply maintenance, installation, fabrication, and design services to the communities of Millington, New Providence, Watchung, Plainfield, and Stirling. In addition, we serve companies in all 50 states. 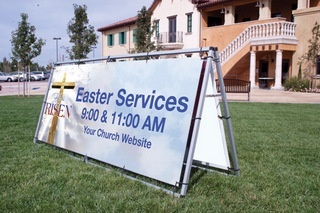 Contact us today for a free estimate on banners for your organization.